Well shiver me reclaimed timbers. . .
One of our first big projects was constructing a bar designed like the broadside of a galleon. We had this in stock for a while after it's original event when we were invited to attend a pirate themed market, as part of the Sunderland Illuminations. A great opportunity to show off the ship, but what else could we make to go with the pirate theme? There had to be something else we could do with a plank or two. That's where the inspiration came to create a kind of treasure chest using pallet wood. The Pallet Earth Storage Chest was born. The original design with a round top lid and a Dark Oak Wax finish has been the most popular ever since and continues to get a lot of attention at markets, fairs and other events - as well as online. Within minutes of the event opening someone asked about a flat-top version. So from the beginning we have offered this option. She wanted it to double up as a coffee table. Others have liked the idea of being able to stack the chests one on top of the other. It's amazing how many places these landlubbers find in their homes for a sea chest! Orders have come in for them in hallways, porches and entranceways, living rooms and dining rooms, landings, bedrooms, conservatories and even one for the downstairs lav. We've adapted it to be a toy box. We've adapted it to be an ottoman. We've adapted it to store the cushions for outdoor seating. Some people like a lighter Pine finish. Some opt for the darker and very smart Walnut or Teak finishes. We can engrave symbols and names on them. The possibilities are as varied as the seven seas. 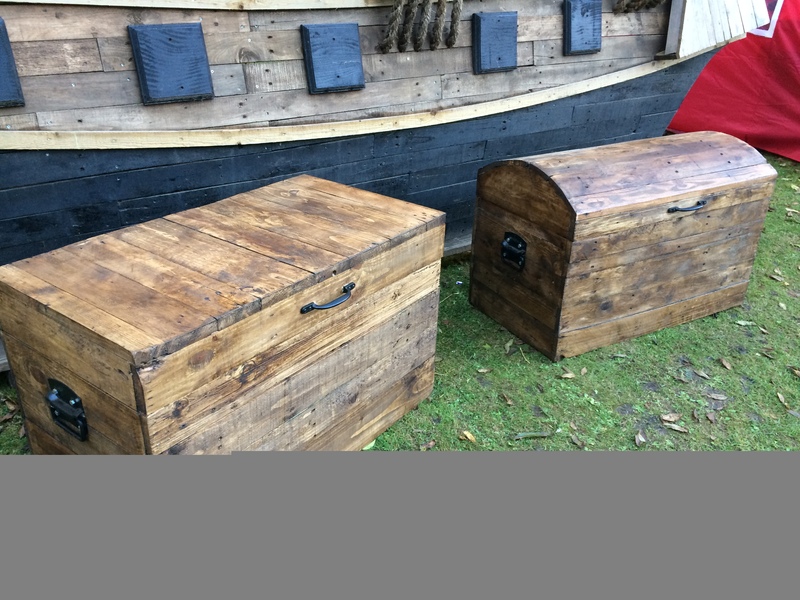 Looking back over eighteen months of this product though, the striking thing is that very first pirate / shanty style sea chest design in dark oak is the version that gets the most attention. Do you agree or can you picture one of our other options in your home? Click here to see more.